Confession: I’m really bad about scheduling hair appointments. By convention, I know I know I should be getting a trim every 3 months, or at least every half a year, but I always end up putting it off. It’s not that I hate haircuts; I just don’t feel any compulsion to go, and there always seems to be something more important to fit into my schedule. 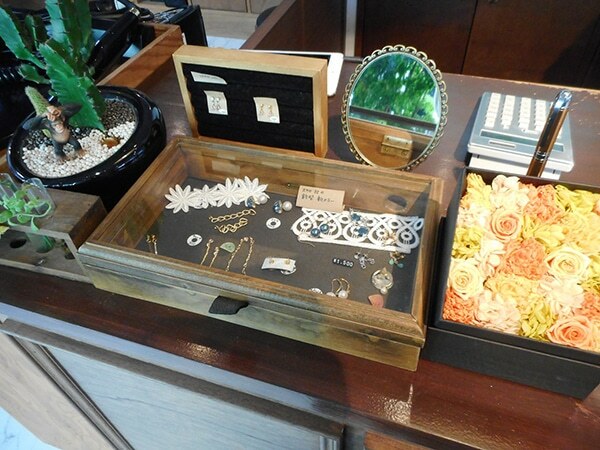 Those were the kind of thoughts I was entertaining the morning I visited PARLOUR&SUN, a hair salon in Kameido, Koto City. Pulling up in front of the building, I was first taken aback by how lovely and spacious it looked, with tall windows and LOTS of greenery. 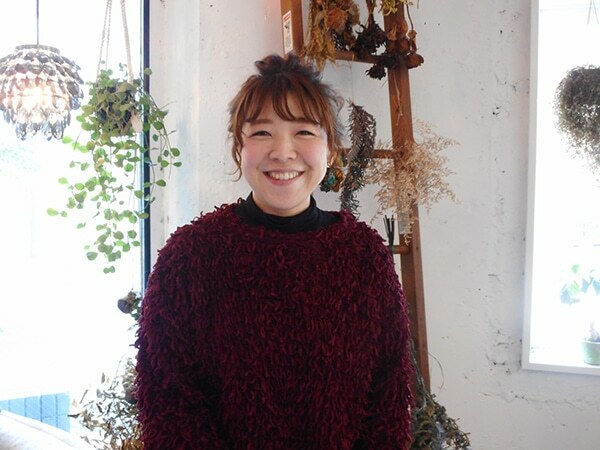 Ms. Kozue Ito, one of the stylists, greeted me warmly and invited me in to take a tour. The plants that surround the building already makes it feel like an oasis, but the theme continues inside, with plenty of potted leafy plants, succulents, and vases of flowers adorning well-chosen surfaces. 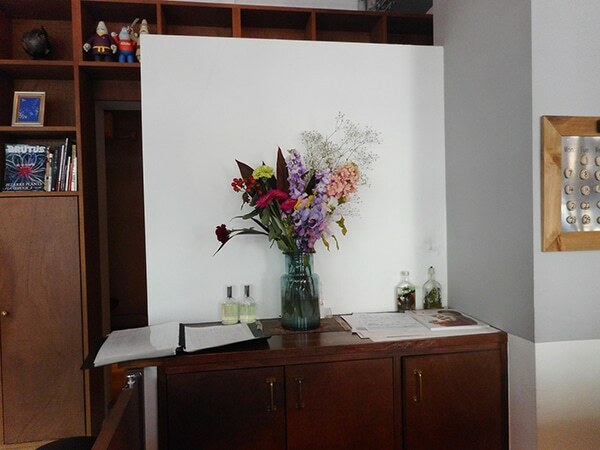 The salon is one big open space, in which the plants seemed to thrive freely. 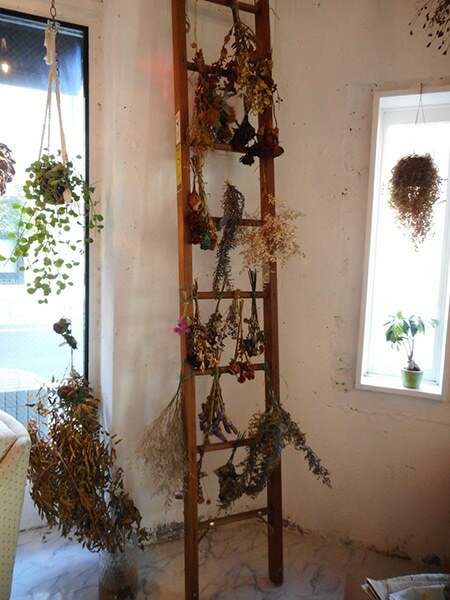 There’s even a corner decorated with bunches of dried flowers from past arrangements. It all felt very comfy but chic, especially against a background of simple white walls, understated furniture, and so much natural light. 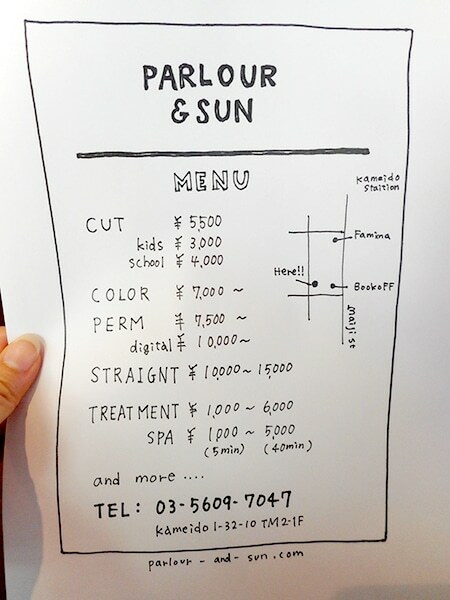 Getting down to the technicalities, PARLOUR&SUN’s menu offers cuts, colours, perms, hair straightening, hair treatments, and head spas, all at a reasonable price. In a private nook towards the back is the shampoo station. Look at this lovely arrangement and lightning; I would feel totally at peace here. Nearby, they also have a station set up to do eyelash extensions. The hair care products used are all (of course) carefully selected, and feature heavily on things that are MADE IN JAPAN. 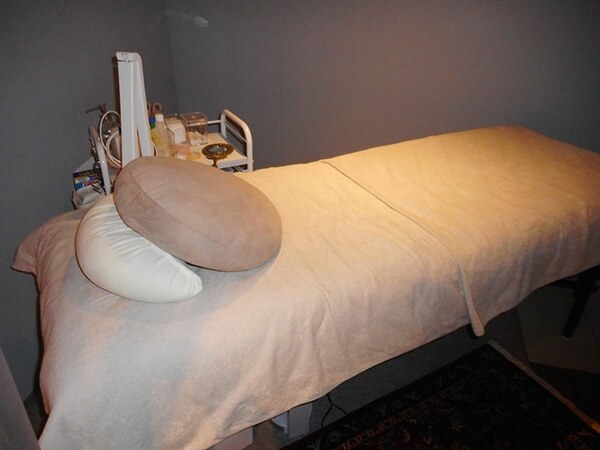 In fact, they even carry MIJ skincare products (toners, moisturizers, etc.) that are only licensed to be sold at hair salons. The brand names were all unfamiliar to me, but Ms. Ito vouched for their effectiveness (she herself uses them and has flawless skin, so that’s pretty convincing). 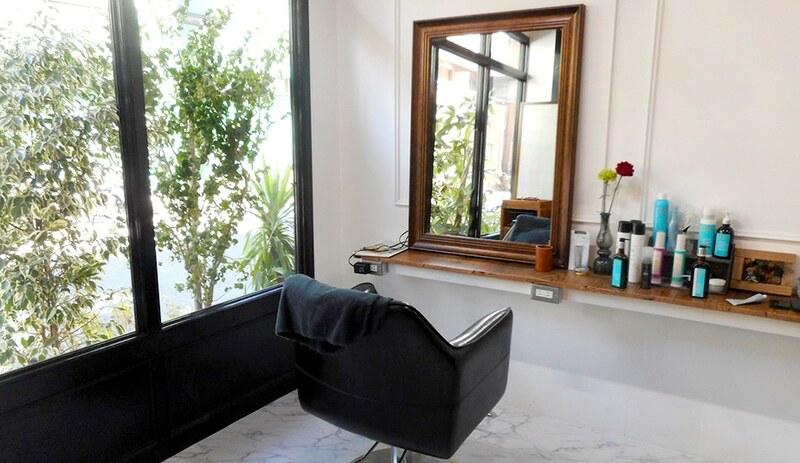 The best part of PARLOUR&SUN, however, is not the tasteful interior décor or top-of-the-line products, or even the bright, clean atmosphere that seemed to envelope the entire establishment (the salon does great justice to its name). It’s the fact that the salon is run by three expert stylists, with no assistants. Usually, assistants are available to do the shampooing, help with blow-drying, and carry out administrative tasks. It would seem like things might be more efficient to hire one, so why the insistence on doing everything by themselves? 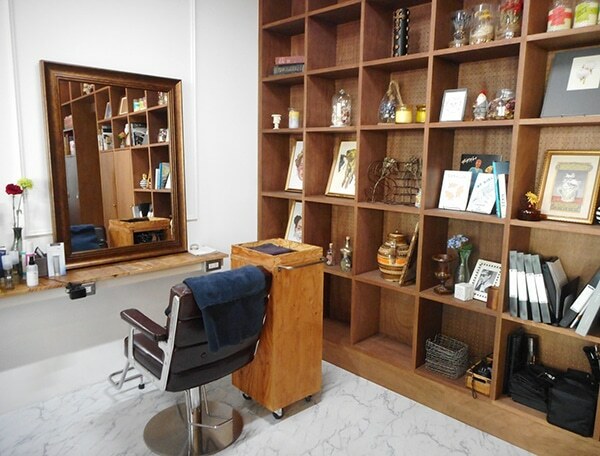 This is the reason the salon, despite its generous floor plan, has only three chairs—one for each stylist to use. 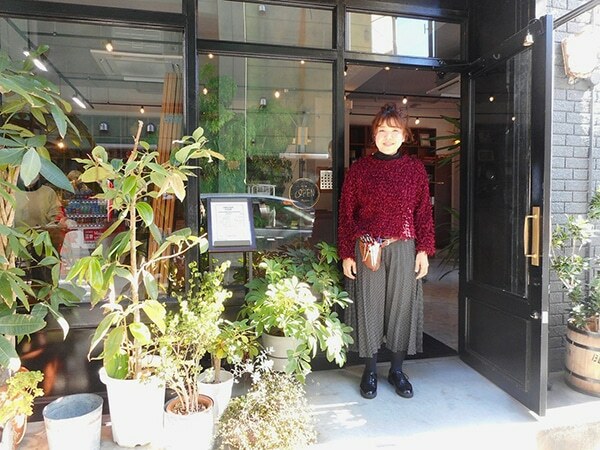 Their philosophy really puts to mind the phrase “quality over quantity,” and I was deeply impressed by Ms. Ito’s sincere desire to connect with each of her customers. So much so, that I asked her if she would be willing to cut my hair on the spot! 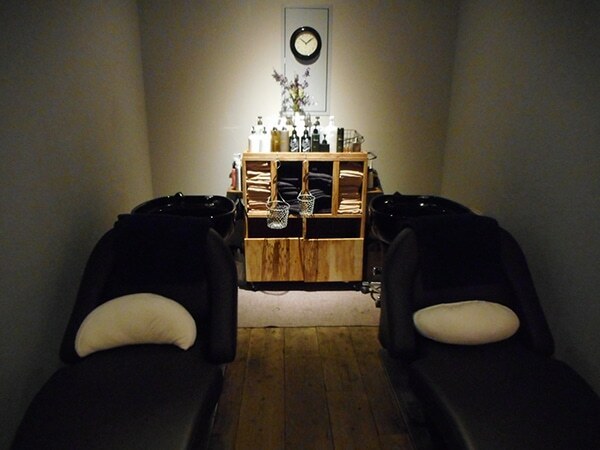 The shampoo station really is an amazingly relaxing space to be in. It reminded me of a spa. The hair care products used smell wonderful—fresh, citrus-y and gentle. It’s perfectly okay not to have any idea of what you want. Ms. Ito pulled out several magazines and carefully discussed options with me, not seeming fazed at all that I am terribly indecisive when it comes to haircuts. She was also a great advisor. There will be no judgement if you, like me, have not been the best about getting a haircut on the regular (phew!). And lastly, I really understood the “no assistants” policy after a session with Ms. Ito. 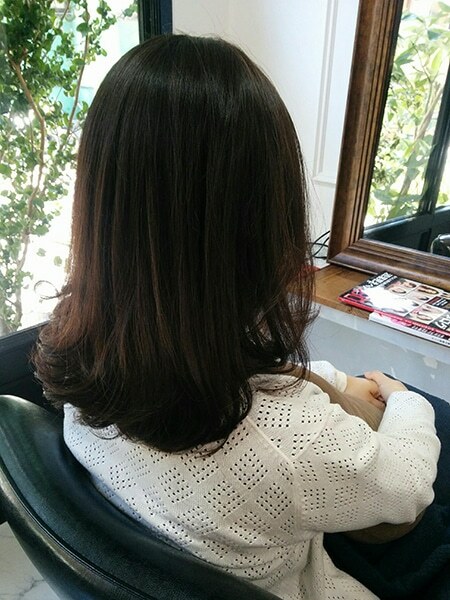 I’ve rarely felt more comfortable with a hairdresser, whether we were talking or silent, and I think it had a lot to do with knowing I had her attention the entire time! I had a pretty important event to attend this day, and having freshly cut-and-styled hair really put me in the right mood, too. I was very happy. In conclusion, I really felt like there was something special about PARLOUR&SUN. I described a lot of what I liked in this article, but I also think there was a certain irresistible je ne sais quoi about the place. Whether all customers tend fall under the same spell that I did is beyond my knowledge, but I’m pretty sure I won’t be waiting a whole year to book my next appointment.